I haven't done a "thanatourism" post in a couple years, but I just returned from giving a lecture on Roman health and diet in San Antonio, Texas, and wanted to post some pictures of my two-day journey, which was led primarily by AIA SW Texas Society treasurer, Joe Lamm, and president, Laura Childs. San Antonio (the 7th largest city in the U.S., did you know that?) is famous for the Alamo, of course, and I learned that the word alamo in Spanish means cottonwood, a type of tree common to the area. The story goes that the defenders of the Alamo, who included Davy Crockett and Jim Bowie, were killed and cremated by Santa Anna, the Mexican general and so-called Napoleon of the west, shortly after the battle in March 1836. This account has been disputed, however, with some suggesting that Crockett surrendered or even that he lived. 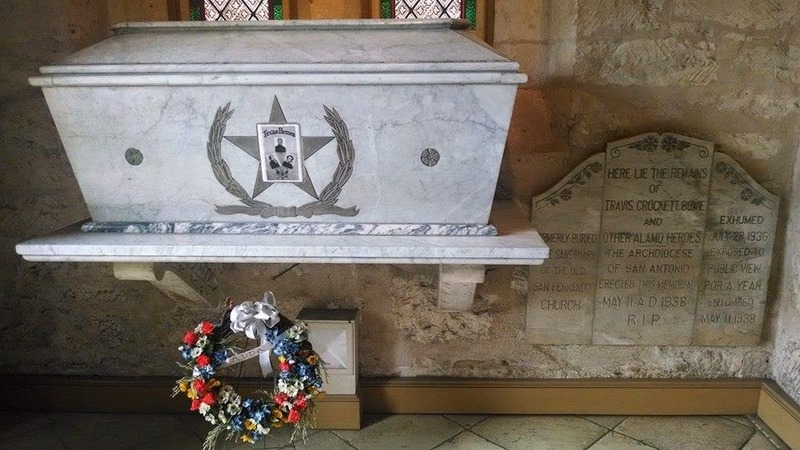 Still, even if we buy that a bunch of Alamo defenders were killed and cremated, there is major discussion about where the remains were buried and whether remains found some time later were indeed those of Crockett, Bowie, and others. I snapped this picture at the San Fernando Cathedral, the oldest cathedral in Texas. The commemorative plaque claims that the remains of these men were excavated in 1938, on view for a year, and then entombed in the marble coffin that has become a kind of shrine. 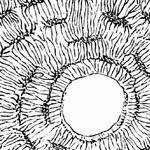 I think it's more likely that whatever cremains still exist (if any) are a jumble of people from a variety of time periods. [Here's more from TAMU.] It's still a good story, of course, of local heroes martyred for defending their home. Laura took me to the San Antonio Museum of Art (SAMA) to see the Greco-Roman collection, although we also peeked into most of the galleries. SAMA's ancient collection has nice breadth, owing primarily to a wealthy collector who donated his massive collection to the museum. So there are two Roman mummy portraits, red- and black-figure pottery, grave stele, marble statues of Roman emperors, etc. 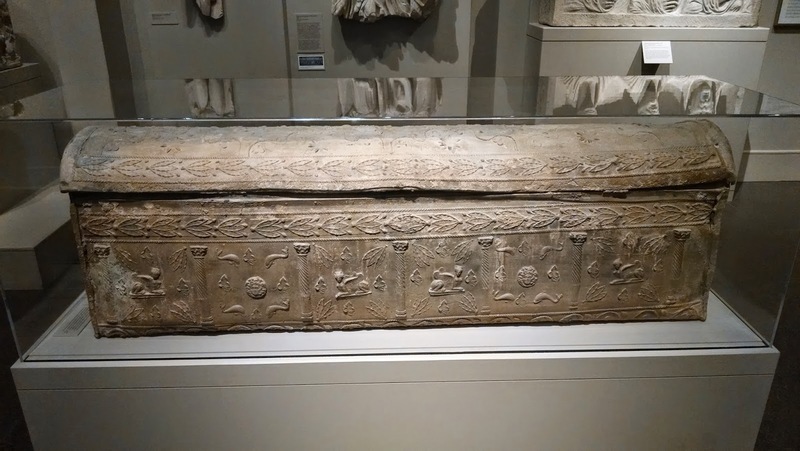 I took a picture of the lead sarcophagus they have on display, which is probably from Tyre (Lebanon) and dates to about the 2nd-3rd centuries AD. I'm not familiar with lead sarcophagi from this area of the world and thought most of them were from areas like Roman Britain. It's a nice piece, but there wasn't a whole lot of information on the card about it. 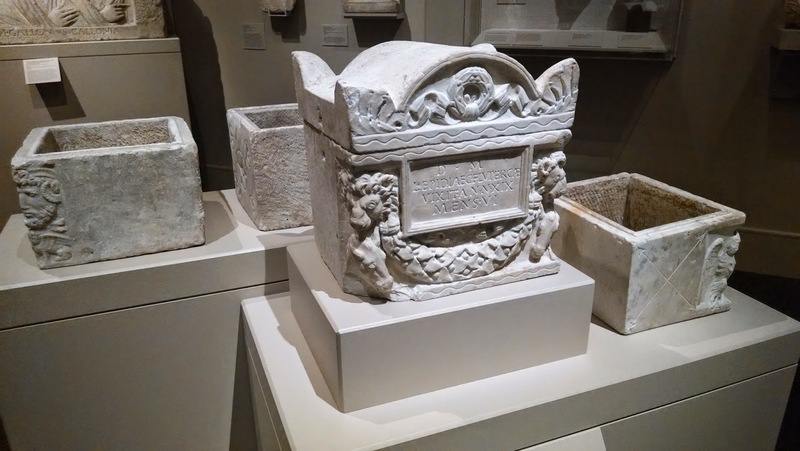 I also took a picture of these Roman marble boxes that held cremains. They are lovely, and their inscriptions have been translated for the information card. But there is little additional context for them, or for the other funerary artifacts. People often ask me why I got into Roman bioarchaeology, as Laura did when we were walking around SAMA. I had originally wanted to do Greek bioarchaeology (which is another story entirely), but the underlying reason was the same: as a kid who voraciously read books on Greek and Roman archaeology and who stared at these kinds of funerary artifacts on display at museums, I really wanted to know where the actual dead people were. 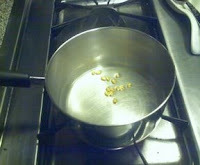 These things are all well and good, and we can learn a lot about fashions and food and other aspects of daily life by looking at them, but I wanted to see the bones. Now, since collectors have bought and sold Greco-Roman antiquities for centuries, it's not really surprising that cremation boxes and lead sarcophagi don't have people in them anymore nor that many of them have poor contextual information that can't be easily conveyed in a museum display or textbook. But these sorts of objects are precisely what piqued my interest in the bioarchaeology of the ancient world. SAMA is a lovely museum, but I wished there had been more contextual information and displays to really show off how various artifacts were used in daily life. 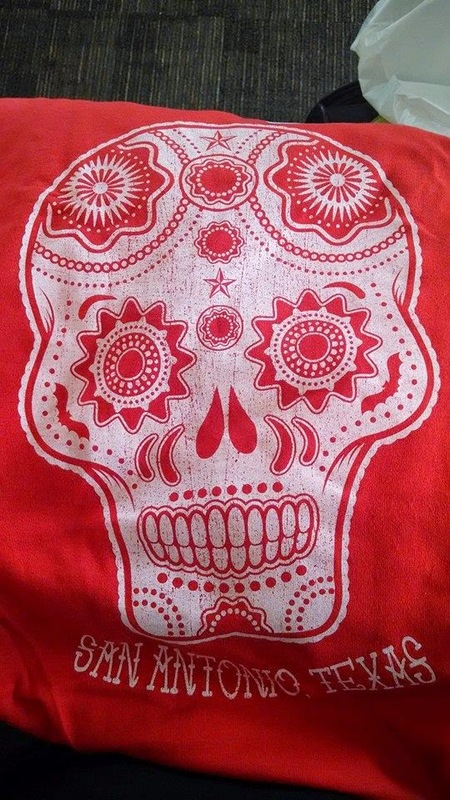 Finally, I don't usually buy myself souvenirs when I go on trips, preferring to get trinkets for the girls (or weirdly flavored salty snacks for my husband), but I couldn't resist this t-shirt I picked up in a gift shop in the San Antonio airport. All in all, an excellent way to spend a couple days! Thanks to the SW Texas AIA society for inviting me to come out and showing me around, and to the attendees at my talk, who made for a very lively question-and-answer session during which I learned a lot!